Master of Engineering, Leningrad Polytechnical Institute, Russia, 1990 (Physical and Mechanical Faculty, "Mechanics and Control Processes Department", scientific adviser P.A. Zhilin, thesis title: "On the theory of media with microstructure"). Candidate of physico-mathematical sciences, St. Petersburg State Polytechnical University, Russia, 1995 (Department of Theoretical and Applied Mechanics, scientific adviser P.A. Zhilin, thesis title: "Dynamics of an unbalanced rigid body on elastic supports"). Probation, Department of Engineering, The University of Aberdeen, United Kingdom, 1999-2000 (Vibration Enhanced Drilling Research Group (VED-RG), head Marian Wiercigroch). Doctor of physico-mathematical sciences, St. Petersburg State Polytechnical University, Russia, 2002 (Department of Theoretical and Applied Mechanics, scientific adviser P.A. Zhilin, thesis title: "Deformation and fracture of solids with microstructure". 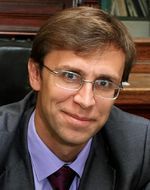 A.M. Krivtsov: the page at the IPME RAS website.